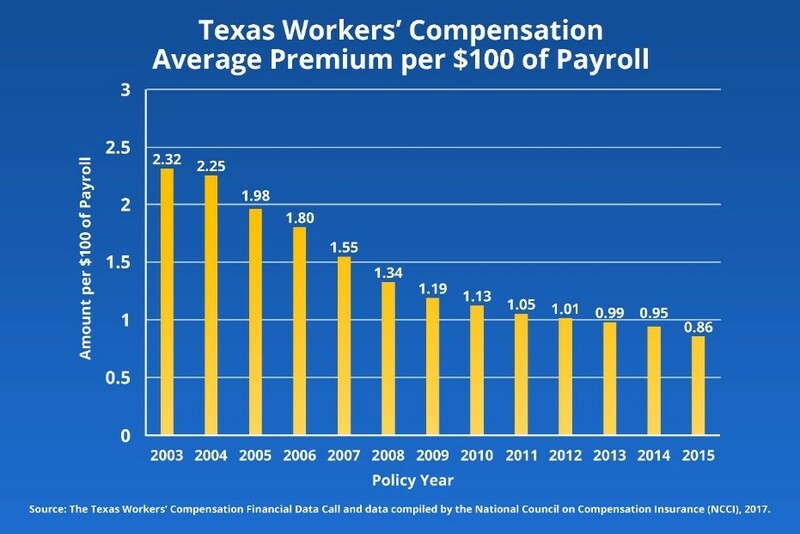 Austin, TX (WorkersCompensation.com) - More Texas businesses are providing workers' compensation insurance as the cost of coverage continues to decline. Premiums have fallen by 63 percent since 2005 as the Division of Workers' Compensation worked to reduce costs and improve care through health care networks, a drug formulary, safer workplaces, and other reforms. In Texas, the average premium for each $100 of payroll dropped from $2.32 in 2003 to 86 cents in 2015, according to the National Council on Compensation Insurance. The fact that fewer employees are filing workers' compensation claims—a 28 percent drop since 2004, has contributed to the decline in premium costs. Non-fatal injury rates are also down 36 percent since 2005, an indication that employers are making workplaces safer. More employees are getting treatment sooner. About 84 percent of injured employees receive non-emergency medical care within seven days of their injuries, compared to 76 percent in 2000. The average number of claims treated by physicians decreased over the last decade, from 21 claims per physician in 2000 to about 15 per physician in 2016. “Looking at the numbers and the trends, we also see that injured employees are getting healthy and back to work faster than ever,”, Brannan said. In Texas, more injured employees are back at work within six months of their injury, and the average number of days off work has decreased by more than 30 percent since 2005.